Soprano, pianist, patron of the arts, and heiress to the Lanvin fashion fortune founded by her mother, Marie-Blanche de Polignac is shown seated in the music room of her hôtel particulier at 16 rue Barbet de Jouy in Paris. 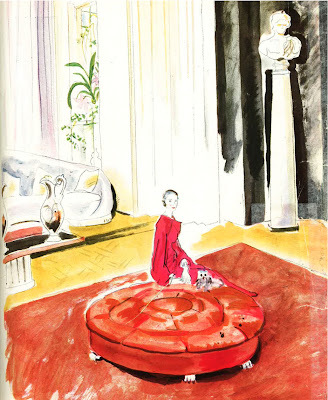 The image is an watercolor illustration by Cecil Beaton, which was published in British Vogue on 1 May 1936. Haute couturière Jeanne Lanvin is justly renowned, decoratively speaking, for the periwinkle-blue apartment she inhabited at 16 rue Barbet de Jouy in Paris, France. Created for her in the early 1920s by Armand-Albert Rateau, its rooms—some of which are preserved at the Musée des Arts Décoratifs—were a frenzy of femininity, the silk-upholstered walls drizzled with embroidered white flowers and leaves sprouting from the carved-wood skirting boards. Its cerulean glory, however, has thrown another significant Lanvin interior, located at the same address, in deepest, darkest shadow: a music room that was commissioned by Lanvin's elegant daughter, Marie-Blanche de Polignac, from Art Deco designer Louis Süe. The only child of Jeanne Lanvin's brief marriage to an Italian nobleman, the former Marguerite di Pietro (1897—1958) was known to intimates as "Ririte" but preferred to be called Marie-Blanche after she became the wife of Count Jean de Polignac (1888—1943). (She was also the inspiration for Lanvin's invention of the color rose Polignac as well as the perfume Arpège, but that's another story.) Music mesmerized her more than fashion, and as a girl the young Mademoiselle di Pietro made plans to become an opera singer, a dream for which the lissome brunette diligently trained and was admirably suited. Artist Jean Hugo compared her silvery soprano to the singing of the sirens of Greek mythology and was impressed that she could spend remain "for hours at the piano sight-reading the most difficult scores." As another admirer observed, "Her voice was ravishing, like Saint Cecilia in person," adding that, in all areas of life, Marie-Blanche's "taste and ... discernment were perfect." Even the American composer Ned Rorem agreed, writing that "were I lost on a desert island with only five LP records, one would be her singing of Monteverdi's madrigals under the direction of her dear friend and mentor Nadia Boulanger." Marie-Blanche, Countess Jean de Polignac, painted by Edouard Vuillard between 1928 and 1932. 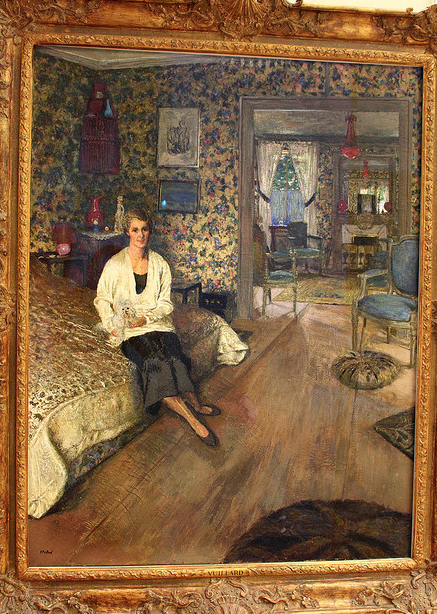 The portrait, which shows the countess in her bedroom, is in the collection of the Musée d'Orsay. Photograph by Ondra Havala via Flickr. Though social engagements sometimes interfered, the "haughtily lovely" Polignac was a founding member of the celebrated Nadia Boulanger Ensemble Vocal. In addition to composing music, performing in concerts both public and private, and appearing on seminal recordings—her husband helped underwrite Boulanger's pioneering 1937 recording of the Monteverdi madrigals—the countess quickly established herself as a sophisticated patron of the arts. Among her close friends were Boulanger, Erik Satie, Gabriel Fauré, Germaine Tailleferre, and, most especially, François Poulenc. Like Satie, he wrote numerous works in her honor, including "Trois poèmes de Louise de Vilmorin," a song cycle that set some of Vilmorin's writings to music. Given those talents and her high-profile marriage to a scion of one of France's grandest noble families—she had been previous married to and divorced from President Clemenceau's grandson Dr. René Jacquemaire—it is natural that Marie-Blanche de Polignac became a magnet for artists. As such she flung open the doors of her mansion on rue Barbey de Jouy, mere blocks from the Invalides, for a soirée every Sunday evening. American pianist and conductor Leon Fleisher described these crushes as being populated by "a whole host of splendid names, aristocrats and cultural figures alike" while singers sang and pianists played. Often new works were aired for the very first time, such as soprano Janine Micheau's rendition of Jacques Leguerney's "Chanson Triste" (1944). This sort of heady entertaining required a suitably impressive and comfortable setting, of course, so the count and countess commissioned the adventuresome Paris decorator Louis Süe (1872—1968) to do the honors. Previously owned by the radical political hostess and art collector Marie-Louise Arconati-Visconti (1840—1923), the Polignacs' handsome neoclassical hôtel particulier would eventually include significant decors orchestrated by Süe between 1930 and 1932. 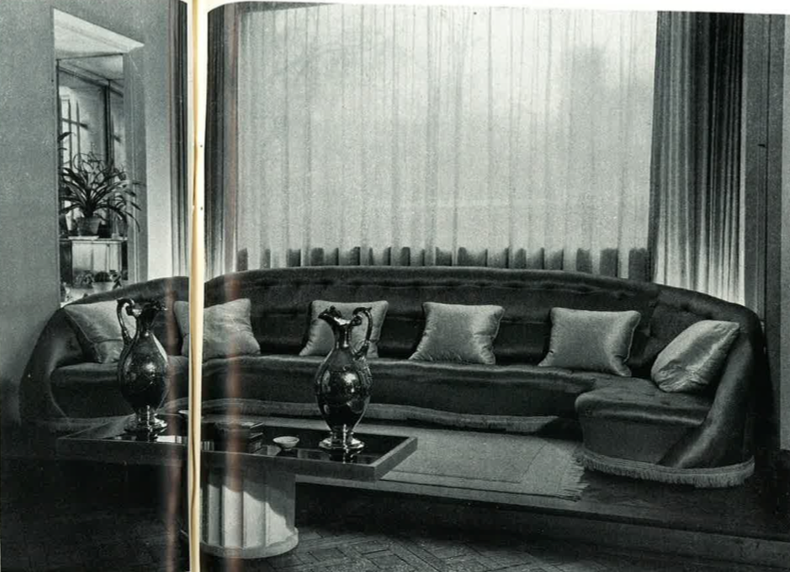 Among them was a dining room inventively frescoed by Christian Bérard; in the 1940s Emilio Terry became involved in the house and installed a neo-Empire mahogany library. 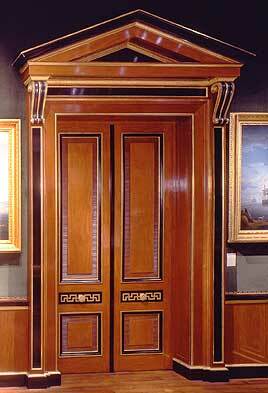 (The paneling of the latter space ended up for sale at the 2002 Biennale des Antiquaires, as shown above.) The mansion, demolished in the mid 1960s and replaced by a dreary modern apartment building, also contained Jeanne Lanvin's admired blue apartment, because mother and daughter, whatever their increasing differences, rarely lived apart. White silk cushions were scattered across the grey satin sofa in Marie-Blanche and Jean de Polignacs' music room on rue Barbet de Jouy. The cocktail table's mirrored top was set on a painted base that recalled a fragment of an ancient column. Interior design by Louis Süe and Henri Gonse. Image by Buffotot published in British Vogue, 10 June 1936. 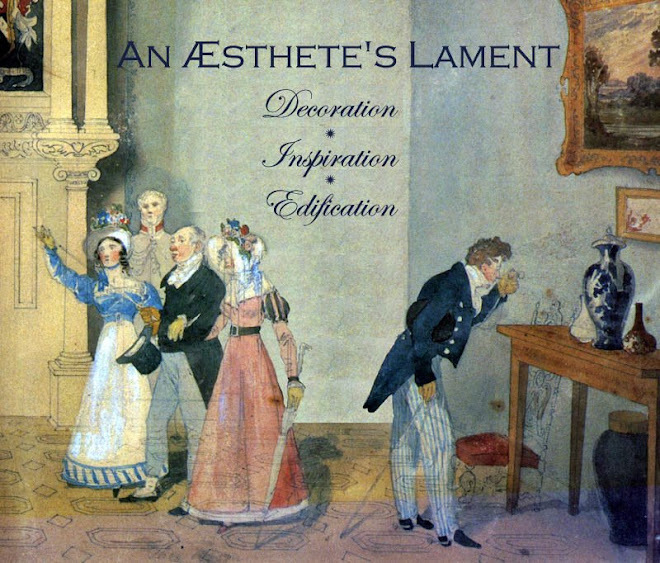 Curiously, given Marie-Blanche de Polignac's reputation for personal restraint, she selected a decorator best known for opulent, often decadent interiors. To name just one example, Süe created an astounding grotto-style dining room set aglow with phosphorescent paint for the Neuilly-sur-Seine villa of fashion plate and writer Daisy Fellowes, a Polignac relative by marriage. (Her formidable aunt Winnaretta, a major music patron backed by Singer-sewing-machine millions, was the widow of Jean de Polignac's composer uncle, Prince Edmond de Polignac.) 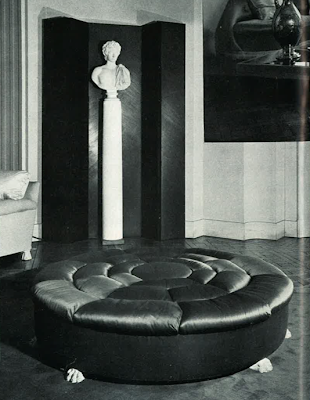 For Marie-Blanche's music room, however, the designer and diplomat-turned-decorator Henri Gonse (1874—1946) soft-pedaled his usual edgy extravagance in favor of haute-couture monumentality. Paved with golden parquet and a coral-pink carpet, the music room at 16 rue Barbet de Jouy was as much a statement of the muscular classicism of the 1930s, though wrought in candy-box colors, as Mme Lanvin's apartment exemplified the feminine frivolity of the 1920s. At either end of the chalk-white room Süe and Gonse carved out wide, ceiling-height alcoves: one sheltered the main door, the other a large window overlooking the Polignacs' garden and the dome of the Invalides. In the latter, a raised platform was constructed to support an immense button-tufted sofa dressed in dove-grey satin and scattered with white cushions. Here six to eight guests could comfortably relax as uplights, concealed behind the sofa, set the filmy pale-pink curtains aglow. At right angles to the Polignacs' satin sofa were smaller windows lined with mirror, which Marie-Blanche used to display potted orchids. Tall folding screens of polished wood were placed in the corners of the room, their ebony complexions setting off a sequence of Roman-style busts perched on tapering pedestals. Here and there tailored canapés stood at the ready, and Süe custom-made the room's centrifugal pièce de résistance: a sumptuous round ottoman, about eight feet in diameter, upholstered in brilliant coral-pink satin, and squatting on a half-dozen lion's paws made of snow-white plaster. The Süe-designed ottoman that centered the Polignacs' salon musical. (The dark area at the top right is an overlapping photograph that could not be cropped out.) Image by Buffotot, published in British Vogue, 10 June 1936. Eighty-odd years after the heyday of that blush-colored salon musical, it is easy to imagine Marie-Blanche de Polignac's Sunday soirées—bejeweled women and brillantined men taking in the latest art song by Satie or Poulenc, sometimes performed by an up-and-coming young soprano, sometimes by their soignée, thirty-something hostess. And with the windows open during the spring, Salvador Dalí archly observed in his memoirs, one could repair to the Polignacs' garden and listen as "string quartets played in the interior all aflame with candles and Renoir paintings and with the malefic coprophagia of an unsurpassable pastel by Fatin-Latour—all this accompanied by petits-fours and much candy and other sweets."